NOW IN PAPERBACK: Sara Pennypacker's Summer of the Gypsy Moths, a stunningly superb story of family, friendship, survival and summer on Cape Cod arrives just in time for vacation reading! 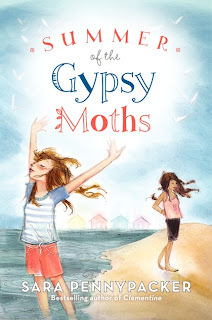 I was not excited about Summer of the Gypsy Moths, the new book from Sara Pennypacker (with superb cover art from the wonderful Julia Denos) when I read the blurb on the back. If you read my review of Joanne Rocklin's The Five Lives of Our Cat Zook, then you know that I read to escape, which for me has always meant choosing a work of fantasy. I am wary of reading "real-life-family-trouble" stories because they often feel too close to my reality as a parent and former kid. However, I am increasingly forced to reexamine my assumptions about "real life" stories and the choices I make thanks to Rocklin's books and now Pennypacker's newest book, Summer of the Gypsy Moths and to acknowledge that there is escapist value (among many other values) to reading a book set in the real world with real-life sorrows and joys. The paragraph in the synopsis of Summer of the Gypsy Moths that made me groan a tiny bit reads as follows, "when tragedy unexpectedly strikes, Stella and Angel are forced to rely on each other to survive, and they learn that they are stronger together than they could have imagined. And over the course of the summer they discover they do have something in common: dreams of finally belonging to a real family." On its own, that summary makes Summer of the Gypsy Moths sound a bit bland and even a little sappy - from my adult perspective, of course. I need to survey some kids and find out what they make of this book when judging it by its cover, which is what I always do - initially, anyway. Because I am immensely fond of Pennypacker's The Amazing World of Stuart books (she also writes the Clementine series of books which I really need to review here) I knew I had to give her new book a chance. By the end of the second chapter of Summer of the Gypsy Moths, page 18 no less, I could not put this book down! Sara Pennypacker's story and her skillful, poetic writing knocked my socks off and had me glued to the page, entranced by the main character, Stella, and her "unexpected tragedy." The main aspect of Summer of the Gypsy Moths that drew me in and kept me reading is also a bit of a spoiler, so I'll leave that until later. Let me tell you about Stella, the quietly remarkable main character of Summer of the Gypsy Moths. At almost twelve years old, she has come by a world view and level of understanding and acceptance of the adults around her, as well as a level of competency that outstrips many adults that, sadly, that no child should have to come by. Stella's mother has finally lost custody of her after years of struggle and flight that have left Stella with the sole mission of creating a home for her mother where she can take care of her, contain her, keep her content enough so that she might find contentment and won't want to flee. Once, while Stella was living with her maternal grandmother, she compared Stella's mother to the fragile, beautiful glass Christmas ornament that she had just unpacked where as the two of them were like rubber balls. Stella and her grandmother bounce when dropped, her mother breaks. With Stella's mother, Pennypacker does a wonderful job shaping a troubled, possibly mentally ill character through glimpses into Stella's memories, never revealing more than necessary about the sadness, uncertainty and loneliness that must be part of Stella's life to young readers. Stella ends up living with her grandmother, and when she dies Stella is taken in by her great-aunt Louise, her grandmother's sister, who lives on Cape Cod and manages four summer rental cottages. Connections are important to Stella, and knowing that her mother once lived in great-aunt Louise's house for a year or two when she was a child, that she ate at the same table and stood in the same doorway, comforts Stella. She dreams that her mother will take her court required parenting classes and come to live happily at Louise's. Thinking Stella needs a companion, Louise takes in a foster child. The daughter of Portuguese immigrants, Angel lost her mother, a fado (a style of music and a word that also means "fate") singer, in a car crash. Her father, a fisherman, was killed when his ship went down in a storm and there were only four safety suits for a crew of five. As the captain, he chose to go down with his ship. Angel is angry and annoyed by everything about Stella and anxious to move in with her aunt, who has immigrated from Portugal to raise her but must meet court requirements before she can take her in. Angel seems especially put off by Stella's domestic skills. A fan of the silver haired home advice columnist Heloise, Stella has ideas about the best way to do everything, ideas that ultimately have much to do with creating the home that her mother will want to settle in. As Louise points out, the two are like oil and water. Until they have a very good reason not to be, when great-aunt Louise dies. BUT ALSO PLOT POINT THAT MAKES THIS BOOK SO FANTASTIC! Maybe this isn't truly a spoiler, but this was definitely a turning point in the book and, while I felt like I saw it coming I still was amazed when it happened. Stella comes home from school to find great-aunt Louise dead in her recliner a week before the rental season starts. Angel arrives a few minutes later and immediately begins packing her bags to run away. Knowing that she has nowhere else she can go, Stella takes the night to think about her situation before calling 911. The next day the girls are surprised to find George Nickerson, owner of the cottages, at the door and ready to help Louise get them ready for the season. The girls lie about Louise, saying she's not feeling well, and offer to help George to keep him away from what is now their secret. While cleaning the cottages, Stella, for whom the idea of a home, especially a home with her mother, is deeply powerful, realizes that if she can prove that she can run five homes - the cottages and Louise's - maybe she will be able to win her mother back. After all, won't her mother inherit Louise's house and everything in it? The girls decide to carry on with the lie about Louise and save up the tips left by renters and any babysitting money they can earn and split it at the end of the summer when Angel will go to her aunt. Then, the part that made me gasp and think, "No way! No way will Pennypacker do that!" comes when the girls decide to bury Louise in the backyard to keep their secret a secret. It sounds crazy just writing it, but Pennypacker handles the scene skillfully and tactfully and (again) from a child's perspective, keeping the truly disturbing aspects of burying a body off the page. How the girls survive in the absence of Louise, running the cottages and keeping themselves fed and clean, is a compelling part of Summer of the Gypsy Moths that I could write a few more paragraphs about, but it is the emotional shifts in Stella and Angel that make this book truly memorable and valuable. Pennypacker layers her story with many meaningful moments, beautiful images, important stories, ideas and memories. While cleaning one of the shell lined bathrooms in the cottages, Stella holds a moon snail shell in her hand thinking, "It spiraled down, as if it knew where it was going, as if the center of all things was right inside itself. I had a funny urge to swallow it, to make all that perfect wholeness part of me. Instead, I pressed it to my cheek, felt its cool, smooth thinness, and closed my eyes." When George startles her and she drops the shell, breaking it, he tells Stella not to worry, that broken things always have stories, interesting stories. While Stella and Angel have their moments, both sweet and sour, it is Stella's changing ideas about her mother that form the backbone of Summer of the Gypsy Moths. Stella has a movie that she plays in her head when she is feeling sad or lonely that has her keeping house and cooking dinner while her mother comes home, looking "so peaceful. And then she looks over at me as if she can't believe how lucky she is. As if she's just won the Mega-Jackpot in the lottery of daughters. 'Hey, Stella,' she says, in an amazed voice. An amazed but peaceful voice. A not-going-anywhere voice. 'Hey, Stella, we're home.'" Towards the end of the book, Stella calls up her movie again in a moment of need and, after a few weeks of watching families move in and out of the cottages, babysitting and seeing how parents interact with their children, "a weird thing happened. My mother still wore the 'I won the daughter lottery and I'm staying right where I am' smile, but this time, she was the one at the stove, and I was the one leaning in to see what was cooking." Arriving at babysitting job, Stella watches as the mother of four-year-old Katie gets ready to go out, holding her daughter on her hip as she applies lipstick, her daughter mimicking her. The mother "dabbed a spot of lipstick on her [Katie's] lips. I had to close my eyes - sometimes when I see mothers and daughters, it feels like I'm being stung by a hot, bright light." There are so many powerful moments, both sad and happy, where Pennypacker's magnificent skill as a writer shine through in this book I could quote her for many more paragraphs. Pennypacker crafts an ending for Summer of the Gypsy Moths that is believable and dramatic, but not catastrophic. There are moments of uncertainty, jealousy and sadness along the way but the right person steps forward at the right time saying just the right thing. Summer of the Gypsy Moths is a book that captivated me in so many ways, from the main character and her quest for a stable home to the fascinating setting of Cape Cod and the cottage colonies, which I really didn't even touch on here. Pennypacker has written a book that I know I will read again, just for the pleasure of spending time with Stella on the Cape.